Masih Nahida has unveiled a new version of his VGADuino graphic shield for Arduino, which aptly takes the form of VGADuino-II and offers a higher resolution, higher speed and 256 colours. The VGADuino-II Arduino shield has this week been launched by Kickstarter and is available to back with pledges starting from just $79, and worldwide shipping expected to take place during March 2017. Watch the promotional video below to learn more about the VGADuino-II and what it can bring to your next Arduino project. 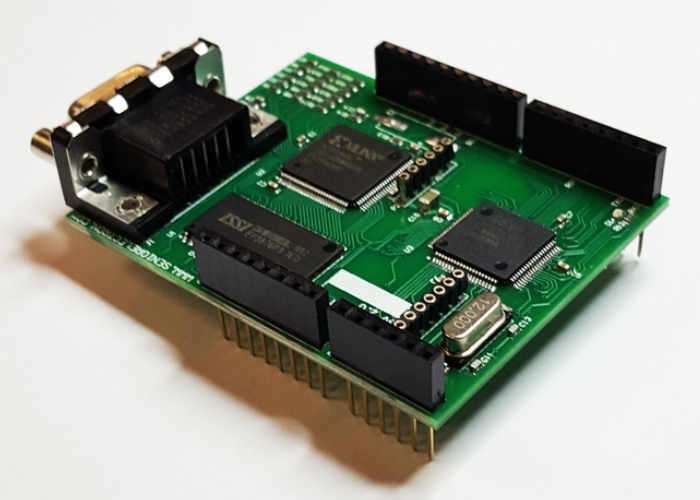 It’s creator explains more about the inspiration, functionality and design of the second generation graphic shield for Arduino. VGADuino is a shield that is made for arduino with all the libraries and samples that user can easily stack it on the arduino board and starts programming. it can connect Arduino to any kind of TV or Monitor with VGA 15 Pin connector and user will be able to show text, numbers, draw lines, tables, shapes and even small images on the screen and use the TV or Monitor as a big display for arduino. Last year i successfully made VGADuino-I and sold it around the world. This year i upgraded the design and made VGADuino-II which the second revision of VGADuino. In this version (VGADuino-II) i used NXP-LPC1756 ARM chip as a main microcontroller and XILINX XC95144XL CPLD for refreshing the display and taking care of the sync signals. there is also a SD Ram to keep the screen’s pixel color data. The screen refresh rate in VGADuino-II is 800×600 60hz but the actual pixels are 400×300 60hz that means we have 400 pixels horizontally and 300 pixels vertically. For more information on the new VGADuino-II jump over to the Kickstarter website for details by following the link below.